Huge Savings Item! Save 14% on the Fusion MS-EL602 6'' 150 Watt Shallow-Mount Speaker by Fusion at Breezin Thru Charters. MPN: MS-EL602. Hurry! Limited time offer. Offer valid only while supplies last. 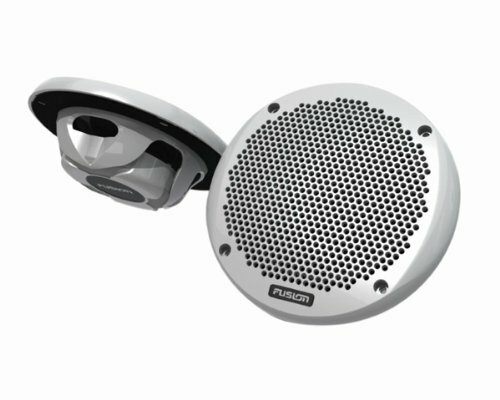 Fusion MS-EL602 6” 2-Way Marine Speakers are designed with flush profile tweeters and a compact basket depth for simple shallow mount installation. View More In Marine Electronics. Fusion MS-EL602 6” 2-Way Marine Speakers are designed with flush profile tweeters and a compact basket depth for simple shallow mount installation. Sophisticated engineering has resulted in superb sound quality from this shallow basket design. The water resistant construction of the MS-EL602 speakers ensure sustained performance when exposed to the marine environment. FUSION MS-EL602 Marine Speakers are covered by a Limited 1 Year Consumer Warranty. 6" 2-Way Speakers, (Pair) Mounting Diameter 5 1/8", Mounting Depth 1 5/8"